The doorbell rang so I have to get it. I opened the door. It was Chris and Darren. “Hi. What are you doing here?" I asked. “We are supposed to have a tour around New York today. By the way I&apos;m Darren Criss. You are KC. Right? "Darren said.“Yes I know. Are you looking for Catherine?" I said. “Yes, where is she? "Chris said.“She&apos;s on that room," I pointed. Chris and Darren went inside the room and went to Catherine&apos;s room. “She is still sleeping," Chris whispered. “I need to go. I have important things to do," I whispered. “See you later. We&apos;ll take good care of her,"Darren whispered. I went out outside the apartment. I felt a hand on my foot. I stand up and screamed.“What are you doing here?!" I asked in a screaming way.“I thought we&apos;re going to have a tour,"Chris said sadly. “Sorry," I apologized. “That&apos;s okay. 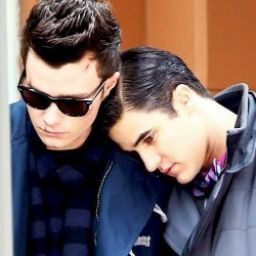 By the way your cousin left us in charge to take care of you," Darren said. I widened my eyes. “What?!" I screamed. I called my cousin right away. KC: I have to do something important. Bye. What am I supposed to do? “Hey,"Chris said.“Wait I&apos;ll just get something," I said. I ran and I slipped,Chris caught me.“Are you okay? "Chris asked. “Yes," I lied. I removed his hands and ran. I went to the bathroom and screamed. “What should I do?!" I screamed. I went out.“Is everything okay?" Darren asked.“Yeah," I lied. I smell something yummy on the kitchen. Chris is cooking pancakes. “Why are you doing that?" I asked.“Since I think you don&apos;t want to go out and have a tour, I&apos;ll just cook you breakfast,"Chris replied.“Sorry. I guess we&apos;ll stay here," I said. “What is this video?" Darren asked.“No!" I shouted. Darren is still watching the video.“Is this you and your cousin?" Darren asked.“Yeah it&apos;s us," I said. When Darren was watching, I couldn&apos;t stop laughing. “This your crazy side. Huh? "Darren said. “Yes," I replied.“Breakfast is ready," Chris said. “It&apos;s great," I complimented. “Chris take a look at this," Darren said. Chris joined Darren in watching the video. “Is that you?" Chris asked.“Yeah," I said. Chris and Darren laughed out loud. I continued eating. 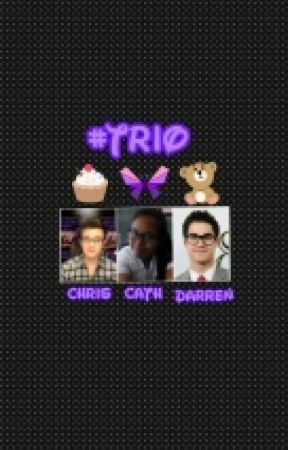 Chris and Darren joined me in the table. “What do you want to talk about?" Darren asked.“Nothing," I replied.“What&apos;s wrong?" Chris asked.“I&apos;m very upset coz I didn&apos;t stick up to the plan for today," I replied sincerely. “Don&apos;t be upset," Chris said.“Maybe I&apos;ll just watch," I said. I get of the table and watch. Chris washed the dishes and joined me.“Why are you sad? "Chris asked.“I&apos;m not sad,I&apos;m bored," I said. “What do you want to do?" Chris asked.“Sing," I replied happily. “You know how?" Chris asked.“Yeah," I said. “What did I missed?" Darren surprised.“She knows how to sing,"Chris said. “That&apos;s amazing. Why didn&apos;t you tell me? "Darren said.“Who will start?" Chris asked.“I guess I&apos;ll start," I said.“Let&apos;s take a video of it,"Darren said.“Great,"Chris said.